Photos - If you have any photos of this cemetery please email me. Woodland Cemetery was first incorporated as West Newark Cemetery in 1855. The name was later changed to Woodland Cemetery. Most ethnic groups are represented even though in the early days it was call "The German Cemetery". It was founded by the Hayes and Kruger families. This cemetery has 55 acres and has become the final resting place for a significant number of Greek ancestors, African-Americans and many War Veterans including about 336 from the Civil War. There are more then 80,000 burials in Woodland. Woodland Cemetery is a non-profit company with a small trust fund. It is managed by a board of trustees and is maintained by a hired contractor. The cemetery is private property. The cemetery itself is owned by individual plot and grave owners. All graves are in the ground. There are no above ground vaults." Since the 1960's Woodland Cemetery has endured vandalism and many of the other problems that have inflicted the inner City of Newark. In the last few years things have improved but there is still a lot to be done. There has been the desecration of more than 11,000 graves of babies, children, and adults that have been buried over with people that are unrelated to that family. The first family graves are gone forever. This destruction includes the graves of several Civil War Veterans. The Woodland Cemetery Board of Trustees was sued in 1999 because of this desecration. The State of New Jersey was also named in this lawsuit because they had been notified in the 1970's that the destruction was going on. The lawsuit was dropped because Woodland Cemetery's money was in a trust fund and could not be touched. The state was released from the lawsuit for reasons unknown. The phone number of Woodland Cemetery is 973-824-7295, and reaches Rosemary Hilbert, President of the Board of Directors. For record searchs, contact Mary Lish via email (click on her name below) or via mail or contact John Sass by mail (see below). The New Jersey Historical Society has the actual index cards of Woodland Cemetery's interments that starts around the late 1890's and goes through the 1970's. The society's address is 52 Park Place, Newark, NJ 07102. Their phone number is 973-596-8500, extension 249 (library section). Due to budget cutbacks, they are only open by appointment. 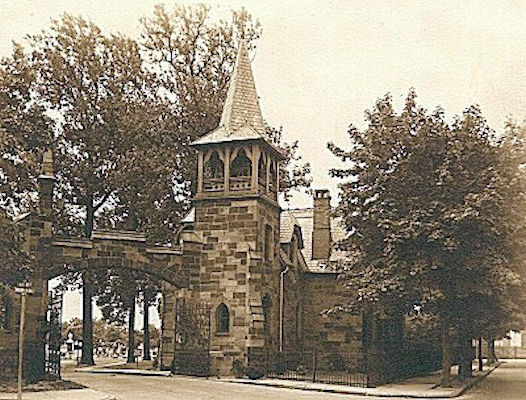 The gate entrance for Woodland Cemetery is located at 670 South 10th Street between Springfield and Avon Avenues, Newark, NJ. Directions - take the Garden State Parkway to the Springfield Ave. Irvington Exit #143. Take Springfield Ave East till you see the cross street - South 10th. Make a right onto South 10th St.
Any other information that you believe will help in the search. FOR A FINE JOB AND FOR THE HELP YOU HAVE GIVEN TO THE VISITORS OF OLD NEWARK. "Woodland Cemetery occupies a very beautiful situation off Springfield Avenue, opposite South Tenth Street, and on the highest point of the hill towards Irvington. The Company was incorporated in 1855, and the grounds comprise an area of about thirty-five acres. Passing the gateway, through a pleasant grove, and advancing under the shadow of 'innumerable leaves,' we find this rural grave yard overlooking the wide valley that stretches from the more southern portion of the city. Almost before the eye is caught by the mementos of the 'city of the dead' it is claimed for a passing glimpse of the city of the living. Churches and spires cluster to the north, and the magnificent panorama so often mentioned in these pages, of river, bay and distant hill, lie like a map, in all their distinctive beauty, immediately below. The Cemetery itself is rapidly becoming worthy of its delightful situation. Though incorporated in 1855, it is only of late years, that large and systematic improvements have begun to be carried out, but now it has many handsome monuments, perhaps, individually noticeable, for extreme and costly elegance, but a large number are very tasteful. Gothic and turreted spires, tapering shafts surmounted by urns, and broken columns handsomely draped, are the predominating features. At first, the Cemetery was largely German, and still, the visitor is struck with the large number of monuments that bear the German letter. Everywhere, there is the language of Fatherland. From the unequaled beauty of its situation, however, it is now eagerly sought by our native population, and the number of interments are equal to those of the other Cemeteries of the city. The lot enclosures are principally laurel. On single graves, rude crosses, and home made boxes for wreathes and flowers - those fond tributes of affection - are very numerous. East and north, there is a perfect wilderness of baby graves, the young being mostly buried side by side in one spot. On these are placed every device that loving hands can frame. Many a parent all unused to carpentry, has made a bower, or a cross, or at least some rustic frame work, to mark the quiet bed of his little one. It is in contemplation to erect a chapel on Chapel Avenue, to be used for services during stormy weather. Below it will have vaults for the reception of the dead, while awaiting a more propitious day or the section of lots. Provision will also be made for a number of private vaults, so arranged that the outer walls of the chapel can be used for the erection of memorial tablets. The situation of the chapel will be an unusually fine one; on the verge of the hill, and commanding a view in clear weather, of the spire of Trinity Church, New York, and all the more striking features of country that lie between. When the walks and paths have undergone contemplated improvements, there will be few pleasanter Cemeteries anywhere than Woodland."